A pod-based super automatic machine that falls short of greatness. It’s an extremely inexpensive option though, and may be a good fit for some users, although even then, there are better, more robust machines on the market for not much more money. Recommended for: Provisionally recommended for (some) casual coffee drinkers. Are you in the market for a simple, convenient, one-touch, pod-based coffee maker that gives you the freedom and flexibility to enjoy all your favorite drinks at the touch of a button? 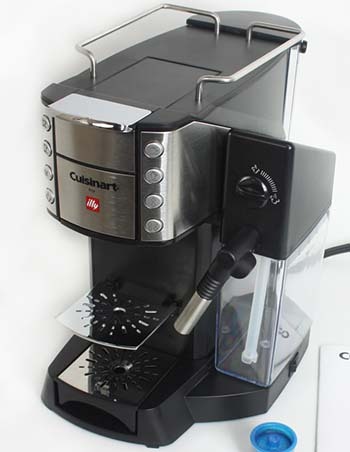 If so, then the Cuisinart Buona Tazza EM 600 may be the right machine for you. However, there are a few catches because while this model gets the job done, it falls well short of greatness, and its various limitations may be deal breakers. Assuming you can live with the limitations inherent in the model’s design though, for the right user, this can be a great addition to your home. It will satisfy your specialty coffee craving at a bargain price! We’ll cover everything this machine can and can’t do, and outline the reasons why you may want to consider some other machine in the sections that follow, so you’ll have all the information you need to make an informed decision. The first thing you’ll notice about the Cuisinart EM 600 Buona Tazza is that it’s a relatively slender, stylishly designed machine, measuring 14” x 7.75” x 11.75,” and weighing in at just fourteen pounds. At that size, it’s small enough to fit comfortably in smaller kitchens, even if countertop space is at a premium in your house. The light weight stems from the fact that the machine is constructed from sturdy ABS plastic, rather than stainless steel, which is common on high-end machines. Some people may not like that, and it’s true that it’s not as durable as more expensive models, but with proper care and regular attention to maintenance, there’s no reason it can’t serve you well for at least a few years. 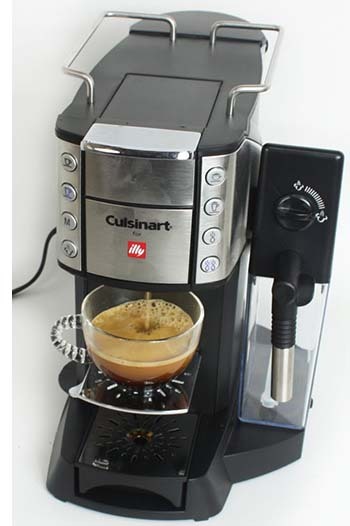 Note, however, that this model is manufactured in China, and as such, the production quality is a bit lower than machines made by companies like Gaggia or DeLonghi, which make most of the machines they sell in Europe. Dressed in a mix of silver and black plastic, it would be a stretch to call the machine attractive, but you can tell that the designers did put some time and effort into making it aesthetically pleasing, so while it won’t win any beauty contests, it’s certainly not off-putting either. This is always a big deal for us, and our Cuisinart Buona Tazza superautomatic single serve coffeemaker review wouldn’t be complete if we didn’t pay particular attention to the reservoir. For us, as power drinkers, there’s no such thing as a water tank that’s too big! Unfortunately, the Tazza underwhelms here. It’s got a 34-ounce top-loading water tank located at the rear of the unit. 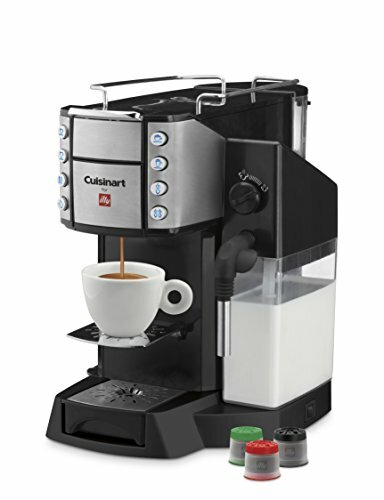 This is certainly acceptable for individual coffee drinkers or small households with casual coffee drinkers, but more than that and you’ll overwhelm this model’s capabilities. The reservoir is not designed to accept a filter, which means you’ll either have to live with regular descaling or use distilled water in your machine to reduce the amount of maintenance you have to do on that front. Also, note that the reservoir is dishwasher safe so that you can give it a bath when and as needed. This will be a short section because this machine is designed to use coffee pods, not beans. As such, although it is a superautomatic, it does not include an integrated grinder. We wanted to be sure to make a note of it, however, so you’ll have a complete picture of exactly what you’re getting! The Cuisinart Buona Tazza only has a single boiler, but it utilizes dual heating technology which helps to minimize your wait time. What happens with most single boiler machines is that when you’re making a milk-based drink, you’ve got a notable time lag as you wait for the boiler to shift gears, switching from brewing mode to milk steaming mode, but that’s not the case here, and it’s a nice touch on such a modestly priced machine. We were impressed! As to the boiler itself, it’s fairly standard fare, being constructed of aluminum and lined with stainless steel. That’s the current industry standard, which is fine. Most super automatics have coffee spouts that you can move up and down. It’s a small but important feature because putting the spouts right at the lip of whatever cup you’re using will increase the amount and quality of crema in your cup. The Tazza doesn’t do that. Instead, it’s got a place to put your cup on the drip tray, and a fold-out platform you can deploy when using a smaller cup. That’s an interesting way to accomplish the same basic goal, but honestly, the telescoping spigots would have been a more flexible, and ultimately more useful option. We didn’t knock any points off for it, but we do regard it as weak design. There’s no need to reinvent the wheel here because there’s already a perfectly acceptable solution available. The company choose to do it anyway and wound up with something that’s not as useful. That’s certainly not a deal breaker, but we wanted to draw attention to it. The brew unit of the Cuisinart Buona Tazza EM 600 is not removable, but it’s also sealed, so you shouldn’t need to do more than run a periodic fresh water rinse (about once a week). This just amounts to filling the tank with fresh water and making use of the “M” button to run hot water through the system’s plumbing to flush it out. That’s all there is to it! The control system is likewise a lesson in simplicity. This machine is no more complicated than the drip brew coffee maker you’re probably using right now and has about as many buttons. That’s it. That’s all you have to worry over or learn, so as you can see, it’s pretty simple. You can manually set your coffee strength (which essentially varies the amount of water that gets dispensed), and add milk in the case of a milk-based drink. We’ll talk more about the milk frothing system in a later section. For now, it’s enough to note that it has one and that it, like the rest of the machine, is incredibly easy to use. Note that the machine has an auto shutoff feature, and shuts down after a half hour of inactivity. There’s very little programmability available on this model, which is not surprising, given its modest cost, so it should also come as no surprise that you cannot change or adjust the auto-off timer. We’re okay with all of this. After all, this is a simple, value-priced machine, so we weren’t expecting much in the way of customization or programmability. What you get here is functional, and nothing more. That’s not a bad thing, but if you’re looking for more, then you want a different machine. It’s as simple as that. It should also be noted that this model has had its share of problems. Apparently, when it was first released, and you pressed the “M” button (which is the machine’s one manual, programmable button) to brew coffee, you’d wind up getting more coffee inside the machine and all over the counter than you would in your cup. Those problems have now been resolved, but it gave the model a bit of a black eye and turned large swaths of the market against it. That’s a pity, because again, for the right user, this could be a decent machine. Pro Tip: You can choose between two boiler temperature settings: Hot and Hotter. Hotter is probably the one you want, especially if you’re making a milk based drink, as this will lower the overall temperature of your coffee creation. The Tazza is a pump-driven machine, but before we can say much more about that, we have to briefly outline the difference between drip brew machines and espresso makers. Drip brew machines rely on gravity to move the coffee from the grounds chamber into the pot waiting below. Machines like this use pressure and pressure is measured in bars, where one bar is equal to atmospheric pressure at sea level. The magic number to remember is nine. It takes at least nine bars of pressure to make a great espresso, and this machine’s pump is rated at fifteen bars. In other words, it’s got all the power you need to make a great espresso, every time you use it, and that works for us! This is probably the most important part of our Cuisinart Buona Tazza review, and we have to admit we were fairly impressed. 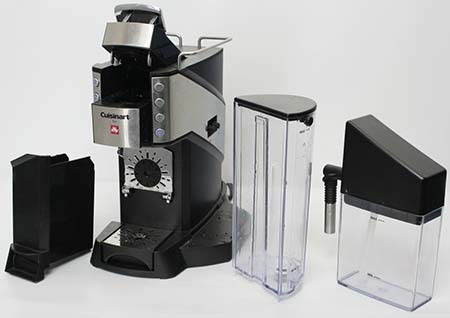 There are two ways a manufacturer can implement a milk frothing system for an espresso machine. A steam wand or an auto-frother. Coffee purists and aspiring Baristas prefer the steam wand, which gives them precise control over the temperature of the milk and the quality and quantity of the foam produced. It takes some skill to use the wand, which is why newbies tend to be a little intimidated by it. Not to worry, you won’t have to learn to use a wand, because the Tazza uses an auto-frother. This is a plastic carafe with a 22-ounce capacity. Simply pour milk into the container, and plug it into the port on the machine when you want a milk based drink. The Tazza offers one-touch Lattes and Cappuccinos, which means that you press the button after loading your coffee pod, and the machine does the rest. You don’t have to move your cup because the auto-frother dispenses milk into it right where it’s sitting. Bearing in mind that this is a very low-cost machine, we weren’t expecting miracles on the milk froth front, and we didn’t get them. What we got though, was steamed milk and froth of a quality that casual users would certainly find acceptable, which is a surprise in and of itself in such a low-priced machine. It even offers you some level of control. There’s a dial located at the top of the auto-frother that allows you to fine tune how much steamed milk you’re getting. Again, the quality isn’t world-class, but it’s better than we were expecting, given the price of the unit, and we regard this as one of the model’s strongest features. There’s not much to say here, except to make a note of the fact that the Tazza doesn’t have one. That’s a pity because cup warming trays are quite important when it comes to specialty coffee drinks, especially milk-based ones. Brewing into a cold cup leads to massive heat loss, and your drink may not be hot enough for your liking. If it isn’t, your best bet is to fill your coffee cup with water and nuke it for a couple of minutes to heat it up. As we mentioned before, this machine is no more complicated than the drip brew machine you’ve probably got sitting on your counter right now. There’s no learning curve to speak of, and cleanup is a breeze as well. The auto-frothing system has “steam burst” technology that keeps the dispensing arm clean after each milk-based drink you create, so there’s not much else to do besides the things mentioned above. 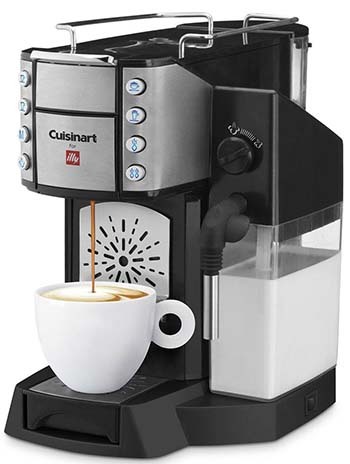 While it’s technically correct to call the Cuisinart Buona Tazza Espresso maker a super automatic machine, we should probably make “pod-based machines” their own category, because these don’t have some of the features commonly associated with super-automatics, like a grinder, for instance. While we’re okay with that, the pod-based system does have some limitations, and this is where our biggest beefs are with the machine. The biggest con for us then is the fact that you’ve got to buy Illy pods to use in the device. K-cups won’t work, and of course, you can’t use beans and grind your own. It’s pods or nothing. That’s both more expensive and limiting. The other problem we have is the fact that the water tank is almost uncomfortably small. 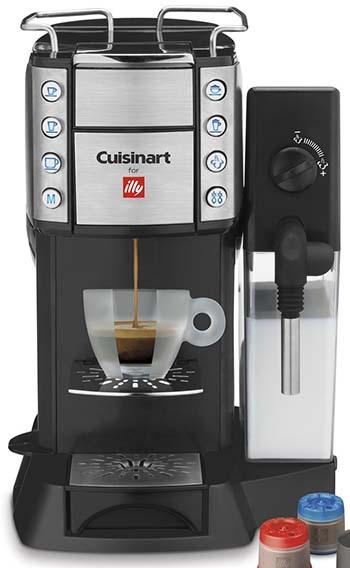 If you live alone, or if the people in your house are only casual coffee drinkers, it’s fine, but the moment a power drinker meets this machine, they’re going to be frustrated, and forget about it if you have a large household with several coffee drinkers. You’d spend all your time refilling the tank! On the other hand, the pod-based system is super-easy to use and convenient, and the addition of the auto-frother means that you can use this device to make all your favorite specialty coffee drinks. You don’t have a lot of control over the final output, but you do have some, and for casual drinkers, that’s probably good enough. Then you’ll probably like this machine. The fewer of those points that apply to you, the less you’re going to like it. We recommend it, but only provisionally, with the points above in mind. Espresso 101: The Methods and Machines Behind the Perfect Shot. Gizmodo. How to Do Latte Art - A Beginner's Guide. Coffee Science. Can Coffee Pods Be Used in a Regular Coffee Maker? eHow.